On March 27, 2018, the Granville Historical Society presented a lecture on “Women, World War I, and the American Century” by Dr. Megan Threlkeld, Associate Professor of History at Denison University. The era surrounding World War I marked the first time that U.S. women participated in public life not just as mothers, but as citizens. Women’s activism for suffrage, their participation in the war effort, and their campaigns for international cooperation after the war established precedents for their involvement in U.S. foreign affairs throughout the rest of the century. We will trace the story of that involvement, highlighting the ways in which women have influenced foreign policy and represented the United States on the world stage. On August 9th, 2018, the Granville Historical Society in cooperation with the Granville Chamber of Commerce presented a program for the community in celebration of the 25th anniversary of the Granville Farmers Market. The evening’s program included reflections by members of the village who were instrumental in the formation of the market in 1993. Members of the farming community in Licking County who have participated as vendors, and the current Market Master added their perspectives of the Market’s evolution through the years. Organizer Lyn Boone and one of the volunteers playing Rev. Thomas Hughes, Brian Gregory. Clarissa Palmer, played by Edna Balser. Edna Balser as Clarissa Palmer and Brian Gregory as Rev. Thomas Hughes. Rev. Thomas Hughes (Brian Gregory) tells visitors about his stone-carving work on Luther Woods' headstone. Bill Kirkpatrick as Luther Woods. Eleanor & Nicodemus Griffith were played by Barbe Helwig and Charles Peterson. Barbe Helwig and Charles Peterson as Eleanor & Nicodemus Griffith. Harriet Munson was played by Maureen Clark. Kevin Bennett, one of our two volunteers playing Rev. Thomas Hughes. Organizer Keith Boone readies the next group of visitors for their tour. 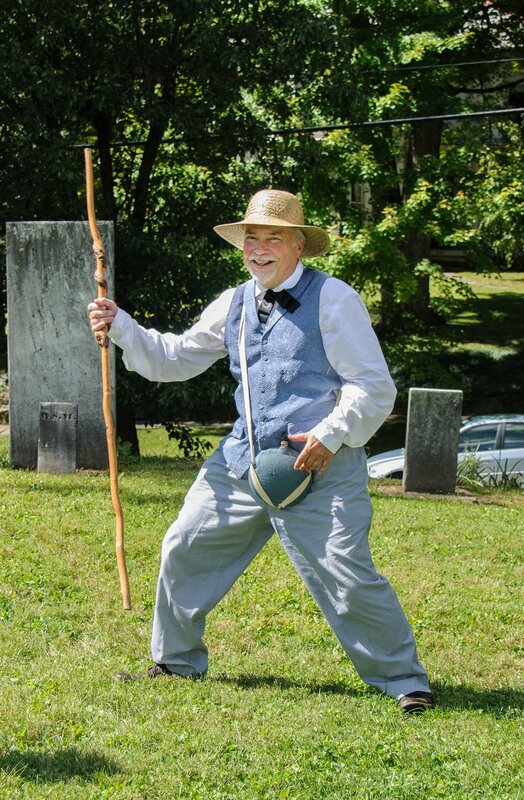 The Ghost Walk enables visitors to the Old Colony Burying Ground in Granville to hear from the “ghosts” of the people who are buried there, telling their stories and their role in Granville’s history. The 2018 Ghost Walk featured the work of stone carver Rev. Thomas Hughes (played by Kevin Bennett and Brian Gregory).